So, today, April 28th, is my birthday, and I'm not really celebrating. Don't get me wrong--I have nothing against birthdays. Birthdays are cool. Turning 56 is a little yawnnnnnn... but mostly, I'm just not doing anything in particular, because, well, me. For instance, my friend John is coming over tonight for a BBQ and to help me out in the garden because my twisted knee is still, you know, twisted. We'll hang out, eat yummy food, and watch a movie. But it doesn't have anything to do with my birthday. We would have done it anyway. The first few pieces of Dangerously Charming swag, including a notebook and a postcard magnet, plus another notebook and a tote bag for Veiled Magic, and a broom pen just because. In case you were wondering what I wanted for my birthday (I know you were), I'd really love to get a few more reviews for Veiled Magic and Wickedly Powerful. So if you've read them, pretty please? Let everyone else know that you liked them? And now, happy my birthday to you! I'm still recovering from severely twisting my knee three weeks ago, and other than having people drive me back and forth to work (I still can't drive, although I did make a very short excursion to the post office down the street on Wednesday to mail off giveaway prizes, so hopefully soon...) I'm basically stuck inside the house. That's Magic the Cat (Queen of the Universe) looking slightly Put Out that her pal Angus has the temerity to touch her tail. But I think it's sweet. Angus has been battling an eye issue (probably viral) one and off since January, and for the last three weeks I've been trying to get antibiotic eye drops into his right eye three times a day. He views this as akin to the tortures of hell, and being a skittish cat to begin with, he has now started running away as soon as I come within five feet of him. Given that he has four working knees and I only have one, this had made the entire thing an interesting challenge... He's now on an oral anti-viral as well, but thankfully my beloved vet was able to get a compounding pharmacy to make it up in liquid form. It was supposed to get squirted directly into his mouth, but not only did that mean catching him an extra two times a day, but it apparently tasted NASTY, since he foamed at the mouth the one time I tried it. Now it is hidden in wet food, and apparently that's working. SIGH. Magic and Mystic enjoying the sunlight. Angus, who took over the patch of sun when Mystic got up, looking perfectly happy as long as I didn't make any fast moves. Little Luna, who stays in the upstairs room most of the time because she is too aggressive with Magic and Mystic is too aggressive with her, has gotten the short end of the stick since I hurt myself, since getting up and down the stairs is difficult. Some days, doing it twice to feed her is all I can manage. But there have been a few days when I managed to catch Mystic and Magic napping in the bedroom, shut the door, and let Luna come run around for a few hours. Here she is enjoying the first day of open windows. Happy Feline Friday to you! Anything fun planned for the weekend? Hi All! Well Deborah and I don’t know the exact publication date yet, nor can we share the packaging design, but at least we have less than a year until publication! We’re so excited! We thought it was time to share another image. 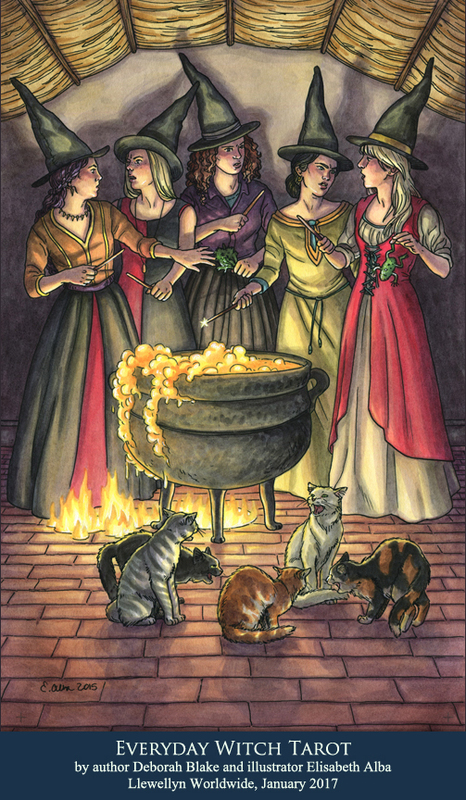 The Wands had a few multi-character cards, AND this one included five cats to boot! A daunting composition to figure out. In the end though, it became one of my favorite cards and I love the colors. Here’s the final image (followed by the full text)! The deck will be published by Llewellyn Worldwide in January 2017. 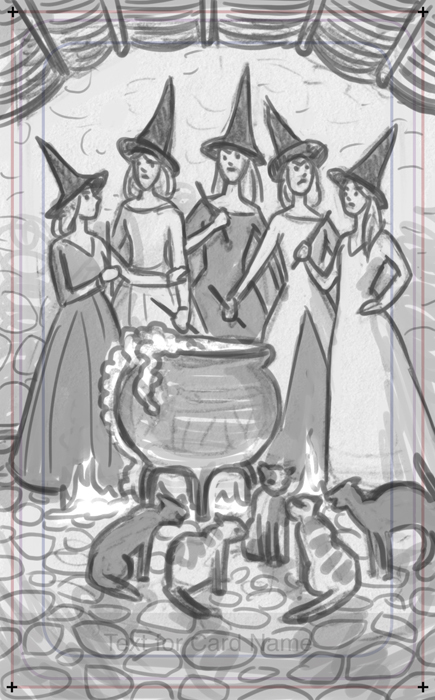 Meanwhile, you should consider pre-ordering the Modern Spellcaster’s Tarot, written by Melanie Marquis and illustrated by my husband, Scott Murphy! As you've probably figured out by now, I love modern retellings of old fairy tales. That's why I ended up writing the Baba Yaga series, based on an updated version of the old Russian Fairy tales of a sometime wicked/sometimes not witch. 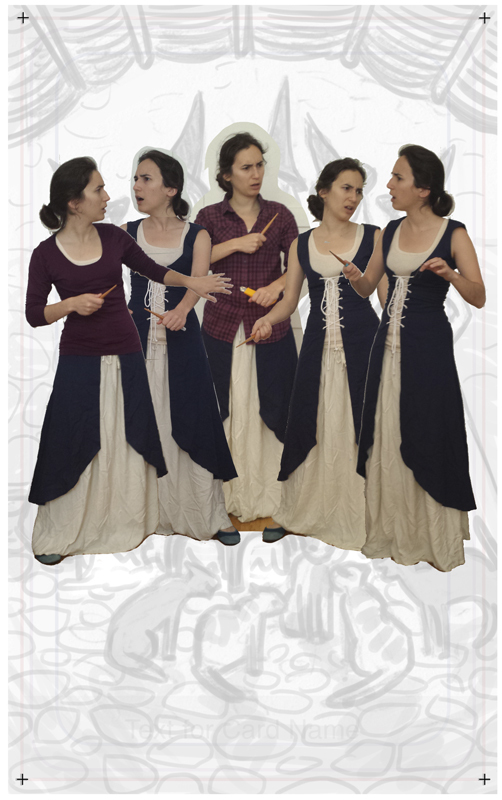 Of course, like all modern retellings, my version is a little bit different from the original. 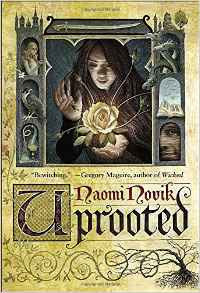 I've been thinking* about just how much I love these kinds of stories lately because my lovely friend Sierra (also my research goddess) recommended a cool book by Naomi Novak, UPROOTED. 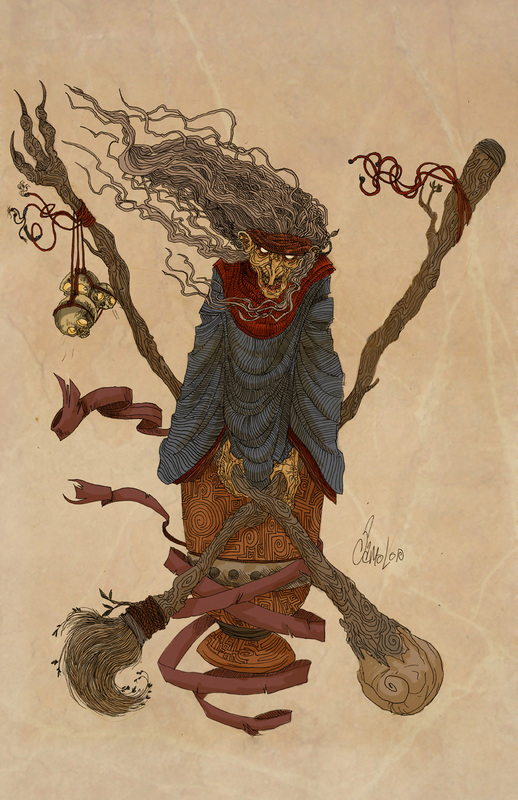 This isn't an updated fairy tale at all, really, just a new one set in a Slavic world like the one the Baba Yagas come from. There is a poor peasant girl who turns out to have magic, a powerful magician named The Dragon, and, well, it's just wonderful. I have so many fairy tales, both old and new, that I love. Jim C. Hines did a great series that put an entirely new spin on the traditional princesses, starting with The Stepsister Scheme. Robin McKinley has written a bunch of them. So I thought we'd spend a little time celebrating all of our favorites. Which means a fun giveaway, of course! I've put together a prize pack including the winner's choice of one of my Baba Yaga books (Wickedly Dangerous, Wickedly Wonderful, or Wickedly Powerful), a cute stuffed dragon, a 3D magnet that says "You say WICKED like it is a Bad Thing" (that one cracks me up), a Wicked Good Beer bottle opener (I found those on Cape Cod last summer and couldn't resist--they're magnetic too, so they can go right on the fridge), a broom pen, and some bookmarks and such. A fun fairy tale kinda giveaway, you might say. Sorry, black cat not included. She was just supervising, as usual. What is your favorite modern or classic fairy tale? *This is what happens when I'm laid up with a twisted knee. So, you might have noticed that things have been a bit quiet over here lately. There's a reason for this. (Those of you who follow me on Facebook probably already know what it is.) Last Saturday, I tried out my new contortionist act, and it didn't go well. So John and I very carefully carried the top of the mattress down the stairs and put it in his truck. Very carefully, because I have steep, narrow, treacherous old farmhouse stairs. Nice paint job, huh? I did that. That's the landing and the top three stairs. Then we went back for the box spring...and things went HORRIBLY WRONG. I swear, I was being really careful. I've lived in this house for 14 1/2 years and I know how tricky the stairs are. And yet, somehow, while John was at the bottom of the stairs with one end of the box spring, and I was coming down the top with the other end, I missed a step. (Note how tall the steps are. Old farmhouses. They really are trying to kill you.) So my left foot ended up on the landing, while my right foot was still on the second stair up. There might have been screaming. (John swears there wasn't cursing, but I'm not sure I believe him.) In short, I twisted/torqued/screwed the crap out of my right knee. Ow. Couch, ice packs, borrowed quad-cane, a bunch of pillows. Watching the unseasonable snow come down outside the window. I can't drive--hell, I can barely walk--so I had to find people to fill in for me at work. (Which they very kindly did.) Friends have brought me food, helped to feed Luna upstairs (I can get up the stairs, but it ain't pleasant), put out birdseed, brought me an Ace compression bandage, even today, helped me wash my hair in the sink, since I can't get in and out of the large cast iron tub that holds my shower. My friend John took me to acupuncture on Tuesday, where my acupuncturist (who happens to be a neurologist most of the time) confirmed that I was doing all the right things, and that unless it still wasn't improving in a couple of weeks, there wasn't much point in going to the doctor. Mostly, he said, it was going to take time. Probably a lot of time. Bah. Kitties to keep me company, and good books to read. Thankfully, I have a LOT of books on the TBR shelf. I thought I'd get a lot of writing done, but to be honest, the first few days I mostly just lay on the couch and read. Apparently your body doesn't like it when you throw it down the stairs. Go figure. 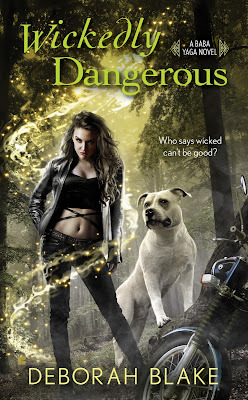 I'm finally starting to get a little bit of writing done, and my editor loved the manuscript I sent her for DANGEROUSLY CHARMING, so the copy edits are done on that--whew. Now I'm working on Gregori's story, which we're calling DANGEROUSLY DIVINE, and spending a lot of quality time with ice packs, not getting much of anything done. Sigh. Did I mention? Don't try this at home, kids. I think I should do some kind of giveaway. (Even though it will be a while before I can get to the post office to mail it out.) How about the signed book of the winner's choice to the person who comes up with the most entertaining/amusing/clever suggestion for what to do with myself while I'm laid up? Keep it clean, people. I'm injured here.